For ovens that see continual and hard wearing use on a regular basis, our Gompels Foam Oven Cleaner is an economic cleaning option. Designed to challenge the other options available on the market, this high-quality cleaner has an alkaline formulation that cuts through tough grease and oils. Powerful enough to use on both the outside and the inside, the oven cleaner is provided in ergonomically designed bottles with handy spray nozzles. Helping to extend the longevity of your device and ensure it's smooth operation, the foam liquid spreads easily into all the small nooks and cranny to ensure you remove every last bit of ingrained food. Suitable for use on grills, ovens and other equipment where caramelised grease or oil is evident. 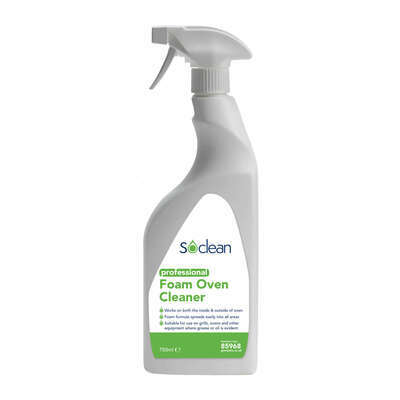 Combine this effective cleaner with our Soclean Extra Cloths or Scouring pads to produce ovens that sparkle and shine. For the protection of hands and skin during more strenuous cleaning routines, we have a wide range of Gloves, Aprons and Goggles, all available at exceptional wholesale prices.